While you won’t be getting any physical games with this particular bundle, what is included is a 1-year membership to the PlayStation Plus service, giving you access to, currently, 12 games with “more added each month.” Also included in the bundle is, of course, the white PS3 with a matching white controller. As an added bonus, this bundle includes the largest capacity hard drive yet at 500GB. You’ll find the full press release below. If you’re ready to purchase, here’s the link to its product page. FOSTER CITY, Calif., Jan. 17, 2013 /PRNewswire/ — Sony Computer Entertainment America LLC (SCEA) today announced that a new color (Classic White) for the PlayStation®3 (PS3™) computer entertainment system, bundled with a year-long membership to PlayStation®Plus, will become available for the first time in the United States and Canada on January 27, 2013 via the Classic White PS3 Instant Game Collection Bundle ($299.99 MSRP). The new PS3 bundle offers exceptional value highlighted by the Classic White PS3 system, with its sleek, curved body design and a 500GB hard disk drive (HDD). The large HDD provides consumers more space to store all of their gaming and entertainment content, including games downloaded from the critically acclaimed PlayStation Plus Instant Game Collection. With a one-year membership to PlayStation Plus, the subscription service package from PlayStation®Network (PSN), consumers who purchase the new bundle will enjoy unlimited access to a regularly refreshed library of 12 PS3 games along with six games for PlayStation®Vita (PS Vita), with new games added each month. In addition to the 18 games in the Instant Game Collection, PlayStation Plus offers members exclusive discounts on games and downloadable content, early access to betas and automatic updates for both games and the latest system software. PlayStation Plus also provides online storage of up to 2GB for game saves (1GB on PS3 and 1GB on PS Vita). Members are already seeing thousands of dollars in value with PlayStation Plus. In 2012, members received more than 50 free and 270 discounted PS3 games, more than 90 add-ons for PS3 and 8 free PS Vita games. 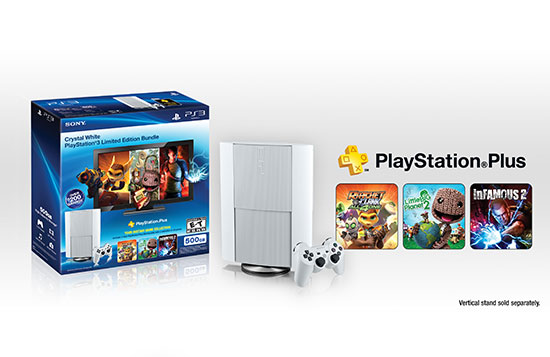 Through PS Plus, members also received a combined savings valued at more than $2,472 in 2012. Top free games offered include: BioShock® 2, LittleBigPlanet™ 2, Super Street Fighter® IV Arcade Edition, Resident Evil® 5, Saints Row 2, Borderlands™, inFAMOUS™ 2, NFL Blitz™, NBA Jam On Fire Edition, The Walking Dead Episode 1 – A New Day, Uncharted: Golden Abyss™, Gravity Rush™ and Gotham City Impostors.